Successfully Added MP3 Player and 4GB Flash Drive with FM Transmitter + Car Kit(Black) to your Shopping Cart. MP3 Player and 4GB Flash Drive with FM Transmitter + Car Kit - Listen to your music with your earphones broadcast it onto your car's speakers! Are you tired of being stuck in traffic with nothing to listen to but your old CDs? Or boring weather reports? Or even worse, morning talk shows? With this one small MP3 player, you can listen to all your favorite music through your earphones or your car's own powerful stereo speakers! Let it make your life easier. Before you head out for the day, pop the cap off this MP3 player to reveal the USB key. Plug it straight into your computer and load it up with up to 4GB of your favorite music in MP3 or WMA format. When you're ready to drive, choose the FM frequency best for you, plug the MP3 player into the car charger, and step on the gas! The built-in FM transmitter broadcasts your MP3 player's audio directly to your vehicle's speakers. Say good-bye to boring drives, as you cruise down the highway listening to your favorite songs on your car's speakers! Don't worry, the fun doesn't have to stop just because you have to leave your car. When you reach your destination, plug in the earphones and slip the MP3 player into your pocket. The MP3 player's light weight, attractive design, and long battery life mean you can enjoy all your favorite tunes anywhere you go. 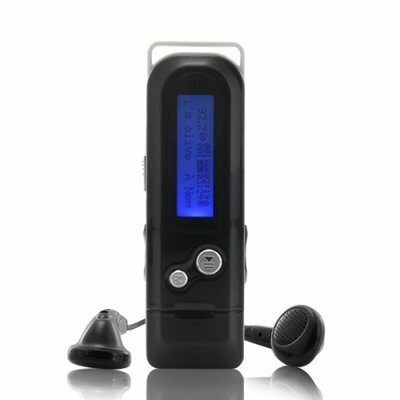 You can also use this MP3 player as a USB flash disk to easily store and move your files. This MP3 player is ideal for those persons who like to take their music with them everywhere, and especially for anyone who wants more exciting drives. Get one for yourself or as a gift today. Order in bulk for greater savings and stock up for your store or online shop. From your best source for high quality, low price electronics, Chinavasion. If I forget my car charger, can I still use this MP3 player's FM transmitter function? Yes, you can use this MP3 player to play music through your car's speakers without the car charger. The FM transmitter is built into the MP3 player, not the car charger. How do I put my music on this MP3 player? Just plug it directly into your computer's USB port and copy and paste your music files. It's that easy. How do I charge this MP3 player? You can charge the MP3 player with the car charger or by connecting it to your computer's USB port. Which FM channel should I broadcast to? It's best to transmit to an FM station with no signal in your area. This way there will be no interference with the MP3 player's signal.